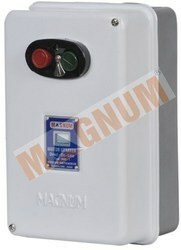 MAGNUM Three Phase DIRECT ON-LINE MOTOR STARTER is a powerful controlling device for your motor/pump made with heavy duty components, which switches and protects your device from hazards caused due to over-current. Magnum Three Phase Direct On-Line Motor Starters are reliable "Workhorses" for domestic, agricultural and industrial applications. Motor Starters are also found in many applications such as drainage, sewage pumping, general industrial pumping and slurry pumping. Rugged MaK-1/MaU/MaCH Contactor with wide voltage band is designed for exceptional endurance. 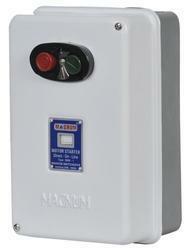 Fitted with MaK-1/MaU/MaCH type relay for reliable overload protection. A latch on the push button can keep the stop button locked, thus preventing accidental starting. Encapsulated coil to with-stand wide voltage fluctuations. Fitted with earthing screw for a safety measure. Manually reset facility after trip. On/Off indications can be visible through the given window. There is a provision for taking on an auxiliary contact block with configuration 1No 1NC or 2NO 2NC. 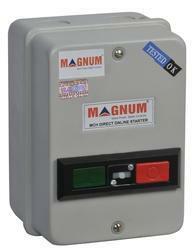 with heavy duty components, which protects the pump from hazards caused due to over-current and voltage. Rugged MaU Contactor with wide voltage band is designed for exceptional endurance. 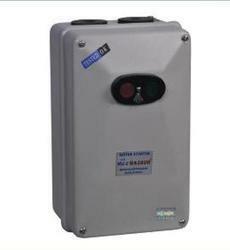 MAGNUM Three Phase MaK-1 DIRECT ON-LINE MOTOR STARTER is a powerful controlling device for your motor/pump made with heavy duty components, which switches and protects your device from hazards caused due to over-current. Rugged MaK-1 Contactor with wide voltage band is designed for exceptional endurance. Rugged MaCH Contactor with wide voltage band is designed for exceptional endurance.